The medallion pattern is arguably one of the most repeated schemes across all types of Persian rugs. However, there is tremendous variation in the shapes and sizes of the medallions as well as the way they are used in various rugs. It’s not wrong to say that no two rugs will have the same medallion layout. Some Oriental rugs have a large central floral medallion surrounded by smaller floral medallions in the rug field whereas others have the same sized medallion repeated throughout the rug either in a parallel repeated pattern or in a concentric pattern. 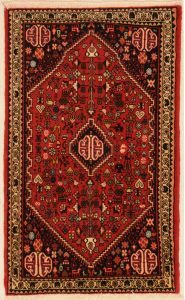 Moreover, in oriental rugs, the medallion can take virtually any form squares and triangles to hexagons, diamonds, octagons, stars, and rhomboids. Floral medallions are a particular favorite amongst most of the weaving communities. This is because they are supposedly a representation of the lotus flower, which the weavers look up on as a sacred flower. A floral medallion may be constructed as a single flower or it may comprise of several small flowers grouped together to form a medallion. 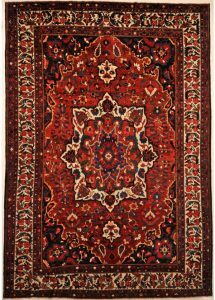 The most common floral Persian rug consists of a central medallion that is framed by partial medallions in the four corners on a background field of flowers, vines, and tree of life motifs. In this category, the principle medallion is featured as a clearly defined central motif which is surrounded by lesser or a greater area of plain ground. The corners of the plain ground usually have busy triangular design elements. The central medallion, plain ground and triangular corners are all framed by a distinct border. While some rug styles represent this category more loosely, other types of rugs have a fixed representation of this style. The Abadeh rug is a classic example of the latter. Abadeh Persian rugs typically feature a single diamond-shaped medallion in the center and 4 smaller motifs at each corner. The central medallion features numerous stylized flower, animal and bird patterns. The rugs in this category are mostly village rugs. They feature one very prominent geometric medallion in the center. The ground surrounding the central medallion is covered with several small motifs which could be in a regular or irregular pattern. The fine details of the central medallion and the surrounding designs make for a visually busy but very interesting looking rug. In these rugs, the medallion is woven in as a repeating pattern or as an alternating pattern. This pattern is typical of the rugs from the Kurdish areas and the Caucasian areas around the Caspian Sea and is also often produced by the tribal weavers of Shiraz, Qashqai rugs and Sennah rugs.